How is it that even on a staycation, Tuesday sneaks up on me??? 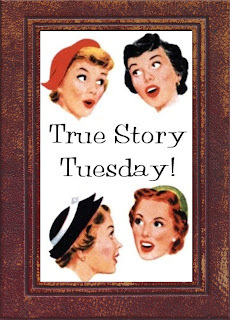 Howdy y'all - ready for some True Story Tuesday? Where we showcase hilarious, amazing, outrageous, miraculous and (mostly) true tales. To Sleep Perchance to Dream Walk? So I'm kinda venturing into uncharted waters here... We have no qualms about posting funny and embarrassing stuff about ourselves on this blog, but usually stop short of posting stories that would embarrass unsuspecting people we know In Real Life. So this story is a couple decades old, but it was funny when it happened, and still funnier than heck 20+ years later. See, my uncle has a slight sleepwalking issue. Anyhoo, Uncle Caesar moved his family up here and they stayed with us while they looked for a new home. During that timeframe, we became intimately acquainted with my uncle's nocturnal adventures. We'd heard stories about the first time he'd stayed at his new in-laws' home and peed in the coat closet in the middle of the night, and how he'd wander and talk to himself in the wee hours - but nothing prepared us for the surreal experience of having him overnight at our home. My mother would describe being awoken by the sounds of someone stumbling into the bathroom after the household had called it a night. Then she heard an odd noise: the sound of the shower doors sliding on their tracks. Then again, accompanied by sounds of thumping. Then a pounding on the fiberglass doors. When others began to awake from the noisy disturbance the scene was funny and sad all at once. My uncle had climbed into the shower in his sleep. Slid the doors closed. Then found himself trapped. He became frightened and began to frantically pound on them. When he couldn't manuever himself out, he began to weep. "Dear God, if you get me out of here, I'll do anything. I'll do anything. Please God!" I love ending my night with your funny posts! This one did not disappoint!!! Uh Oh! I have a sleepwalker that pees while sleeping and walking! He almost peed in my closet tonight! Love a story that gives a giggle, and then ends with "He did eventually find God".... Ya made my day. Oh my goodness. That is so funny!! The poor guy! Reminds me of that story I posted awhile ago about Jdaddy peeing in our coat closet!! We are a sleep walking family too - they lead to some funny stories!! Oh, bless his heart! Scott's grandma had night terrors and would sleep walk like that and it was very hard to wake her up. Sort of freaky. That is funny and sad. I love that you used the word sonambulist. I just listed that on my blog as one of my all time favorite words!! Oh, Lord, I needed that laugh! I have a friend who is a sleep eater - she's woken up multiple times sitting on the couch eating pizza or laying in bed eating string cheese. My sister was a sleepwalker and one of my duties as a child was protecting her and all the assorted stuff she was prone to peeing on! Like the corner of my parents bed or the vacuum cleaner that was stored in the bathroom closet. And we caught Dirk, my step-son, halfway across the front yard one time. Wow! That is some serious sleep-walking! I'm glad he was rescued. Brian used to sleepwalk when he was a kid, and it was from his asthma medication. He didn't have it bad, so when his parents found him outside next to the mailbox and the ROAD in the middle of the night they stopped that medication. Bwahahahahah! That is not funny.... but funny!!!! Do you know how many times I have woken up in the shower at 2:00am wondering what the heck is going on???? TOO MANY! I feel for him! Been there, done that, got the T-shirt! I am glad I am not the only one! I scare my husband a lot with my walking and talking episodes! Fantastic story! I will be smiling the rest of the day! I used to have a friend who slept-walking, and I always got frighten to see her climbing on the railing. Okay, that was hilarious! Haha! I feel bad for laughing, but it was so long ago, it doesn't count, right? And how you challenge your family to start their own blogs - heehee! So glad he eventually found God! *GIGGLES*!!! What a funny story~! Poor Uncle Caesar! tehehehehe! Oh, I have stories to tell about Jerome and my dad! TST posts for at least a month! Good stuff! This is horribly hysterical! I could just picture it in my mind...and now I can't stop cracking up! I had a student in one of my preschool classes that would sleep walk. He'd stagger up off his nap mat and wander around the room. One time I think he was dreaming he was a dinosaur, from his noises and actions! My co-teacher & I would giggle a bit, and gently steer him back towards his mat. 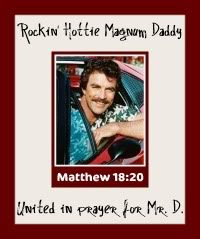 I am glad that he did find Jesus : ) and I am also glad that your mother can email you. Mine? Not so much.